352 pages | 18 B/W Illus. This book takes it as a given that the city is made of multiple partially localized assemblages built of heterogeneous networks, spaces, and practices. The past century of urban studies has focused on various aspects—space, culture, politics, economy—but these too often address each domain and the city itself as a bounded and cohesive entity. The multiple and overlapping enactments that constitute urban life require a commensurate method of analysis that encompasses the human and non-human aspects of cities—from nature to socio-technical networks, to hybrid collectivities, physical artefacts and historical legacies, and the virtual or imagined city. This book proposes—and its various chapters offer demonstrations—importing into urban studies a body of theories, concepts, and perspectives developed in the field of science and technology studies (STS) and, more specifically, Actor-Network Theory (ANT). The essays examine artefacts, technical systems, architectures, place and eventful spaces, the persistence of history, imaginary and virtual elements of city life, and the politics and ethical challenges of a mode of analysis that incorporates multiple actors as hybrid chains of causation. The chapters are attentive to the multiple scales of both the object of analysis and the analysis itself. The aim is more ambitious than the mere transfer of a fashionable template. The authors embrace ANT critically, as much as a metaphor as a method of analysis, deploying it to think with, to ask new questions, to find the language to achieve more compelling descriptions of city life and of urban transformations. 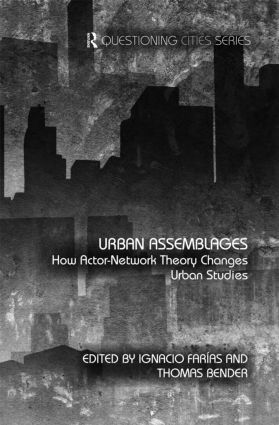 By greatly extending the chain or network of causation, proliferating heterogeneous agents, non-human as well as human, without limit as to their enrolment in urban assemblages, Actor-Network Theory offers a way of addressing the particular complexity and openness characteristic of cities. By enabling an escape from the reification of the city so common in social theory, ANT’s notion of hybrid assemblages offers richer framing of the reality of the city—of urban experience—that is responsive to contingency and complexity. Therefore Urban Assemblages is a pertinent book for students, practitioners and scholars as it aims to shift the parameters of urban studies and contribute a meaningful argument for the urban arena which will dominate the coming decades in government policies.